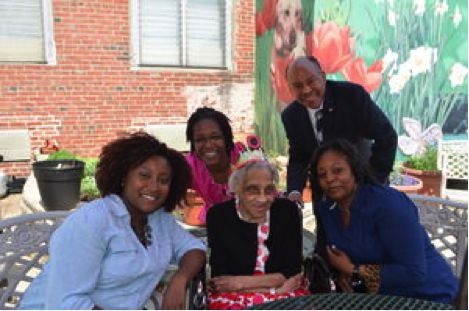 Fannie Mae Steward Ausby celebrated her 108th birthday on May 7, making her the oldest living person in her senior living facility at Renaissance Healthcare and Rehabilitation. Ausby was joined by her family, Renaissance friends and elected officials, including State. Rep. Jim Roebuck (D-188) and mayoral candidate, State Sen. Anthony Williams (D-8). “I feel fine, fine as wine, baby,” said Ausby, of being 108. Ausby was born in Augusta, Ga. and moved to Philadelphia a few years ago to be closer to family. She had one child, a son, who is now deceased, and has lived through two World Wars and 18 presidents. Throughout her life, she has been an avid farmer and gardener. It was during World War II that she survived off the food grown on her own farm; and she is currently a member of the Garden Club at Renaissance. Ausby said the things she remembers most about her life are “work” and spending time with male friends, a pastime she described with a wide smile on her face. Her advice for living a long life centered on God and a free mind. Sen. Williams said Ausby’s life is an inspiration. For her great-granddaughter, Cratissa Hammond, a student in a doctoral program at Chestnut Hill College, Ausby’s life has served as motivation to achieve. “She told me to keep fighting. In two years I will have my doctorate and I hope she sees it,” said Hammond, noting that Ausby is one of the strongest people she knows. “When she was 106, she fractured her hip but she just kept fighting and [now] she has a lung condition. The greatest lesson Hammond said she has learned from her great grandmother, however, is to live freely.